SpoofTel's iPhone Application is the easiest way to spoof your caller ID with your jailbroken iPhone or compatible device. 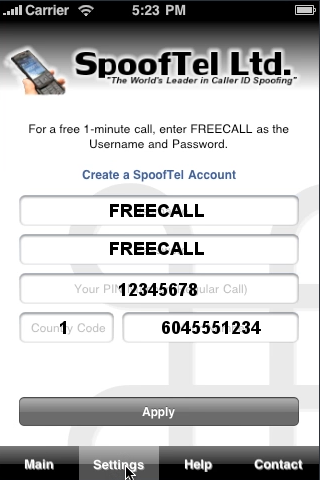 The SpoofTel iPhone app is fully featured, allowing you to record your call and even change your voice. The SpoofTel iPhone app is available through Cydia on your jailbroken phone. To install SpoofTel's iPhone App, click the Cydia icon located on your springboard. If you don't see the Cydia icon on your iPhone, check below for other install options. - Click on the "Search" icon located in the bottom right hand corner of the screen. - Search for "SpoofTel" in the search box at the top of the screen. - When you see "SpoofTel" in the list, click on it to go to the details page. - On the next page click "Confirm" in the top right corner to finish the install. The SpoofTel iPhone app will now be installed on your phone and a new icon should appear on your springboard. Once this is done just reload your springboard by either rebooting your iPhone or using an app like "Respring" and the SpoofTel iPhone app should now appear. There are two ways to use SpoofTel's iPhone app, using the internet or through our toll-free line. Both methods use the same dial screen in order to make calls and is further explained below. In order to use either method you need to enter in your SpoofTel user name, password and your iPhone's telephone number into the proper boxes. In order to use SpoofTel's iPhone app without using the internet, you must enter in your 8 digit PIN number located under "Account Info" when logged into SpoofTel. Make sure your phone number does not have a 1 in front of the area code and appears like the example below. If you have internet access, using "Web Call" function is quick and easy. In order to start a call, select "Main" located in the bottom left hand corner of your screen. - Input your friends country code in the first box and their areacode and phone number in the second box. As soon as you hit "Web Call" you call is initiated. First we will call your number as set under "Settings". As soon as you pick up we will connect you to your friends number you entered in the previous screen. If you selected to record a call, it will be available for download as an .MP3 file under "Account Info" of your SpoofTel account. If you don't have internet the SpoofTel app allows for regular calls through our toll free number. In order to use this method of calling, you need to enter in your SpoofTel 8 digit PIN in the "Settings" menu located at the bottom of the screen. If you don't know what your 8 digit PIN number is, simply login to your SpoofTel account and click on "Account Info". Similar to "Web Call", you will need to enter in your friends country code and phone number as well as the caller ID you would like displayed. In addition, select the call record and voice changing options just as you would a "Web Call". Once all the information is entered in, click on "Regular Call" to initiate your phone call. When clicked, your iPhone will dial our toll free number, enter in your 8 digit PIN, your friends number and your recording and voice changing options automatically.